The Smithsonian Libraries and Smithsonian Gardens are currently hosting an exhibition, “Cultivating America’s Gardens,” which traces the cultural history of this practice as business, means of keeping body and soul together, and pleasurable hobby. 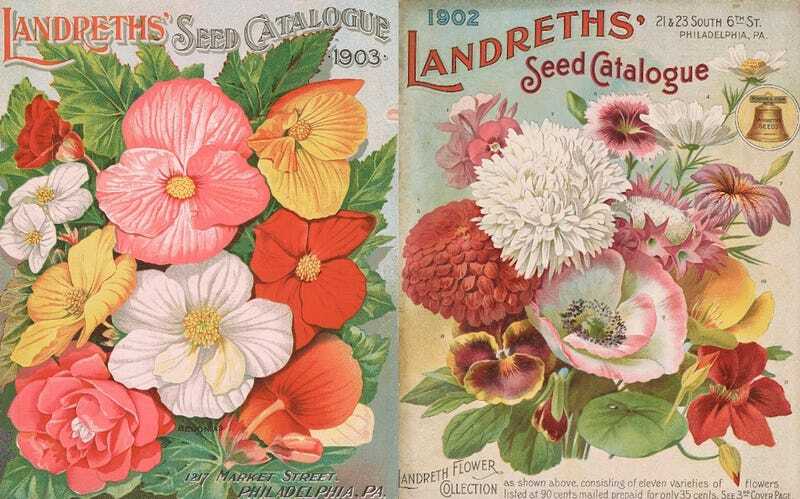 It is a wonderful opportunity to appreciate the stunningly lavish art of pre-photographic seed catalogs. “It is exciting to be able to share the wealth of written and visual materials we have here at the Smithsonian to tell the story of how and why Americans have cultivated gardens,” said Kelly Crawford, the exhibition’s lead curator and a museum specialist at Smithsonian Gardens, in an announcement. The online component of the exhibit explains that, “To attract buyers, seed companies decorated seed packets with mouth-watering illustrations of vegetables and flowers—a significant improvement over early packets that were labeled only with text.” To say the least. Sometimes it gets downright over the top. For instance, these Burpee catalogs are like having gauzy late Victorian commercial aesthetics shot straight into your veins. In fact this is just a slice of the Smithsonian’s collection; the museum has an entire database of seed catalogs, which you can browse here by specific flowers, fruits, vegetables, and subject matter. It would be frighteningly easy to lose an entire day down this particular rabbit hole. Sometimes, however, companies went for humor rather than sheer loveliness. Please enjoy these ridiculous tuber men, especially the carrot dandy with the monocle there in the middle. These were all produced as trade cards, which were beautifully made and therefore popular as collectibles and decorations. According to the Smithsonian, the exhibition covers: “plant exploration and the establishment of botanical gardens, the rise of the lawn, gardens of the Gilded Age (1870–1900), gardens of World’s Fairs, Victory and school gardens, preservation and documentation of historic gardens, the seed industry and plant breeding and sustainable gardens of today.” It runs through August at the National Museum of American History, in the Smithsonian Libraries Exhibition Gallery.